The following checklist will help you take an active role in protecting yourself and your passengers. Your vehicle is equipped with many features that work together to help protect you and your passengers during a crash. Some features do not require any action on your part. 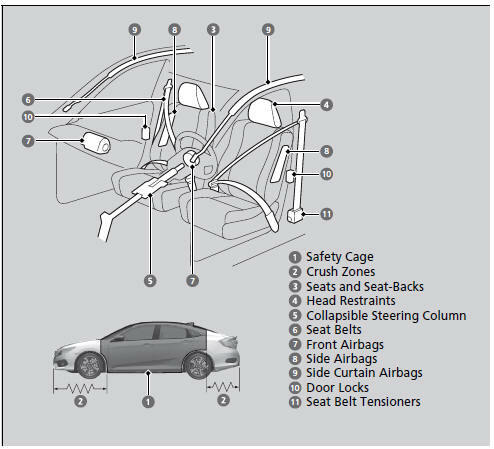 These include a strong steel framework that forms a safety cage around the passenger compartment, front and rear crush zones, a collapsible steering column, and tensioners that tighten the front seat belts in a sufficient crash. However, you and your passengers cannot take full advantage of these features unless you remain seated in the correct position and always wear your seat belts. In fact, some safety features can contribute to injuries if they are not used properly.